Thousands of people travel each year on one of the most dangerous roads in the world, shaky and Candura beaten paths on steep cliffs. 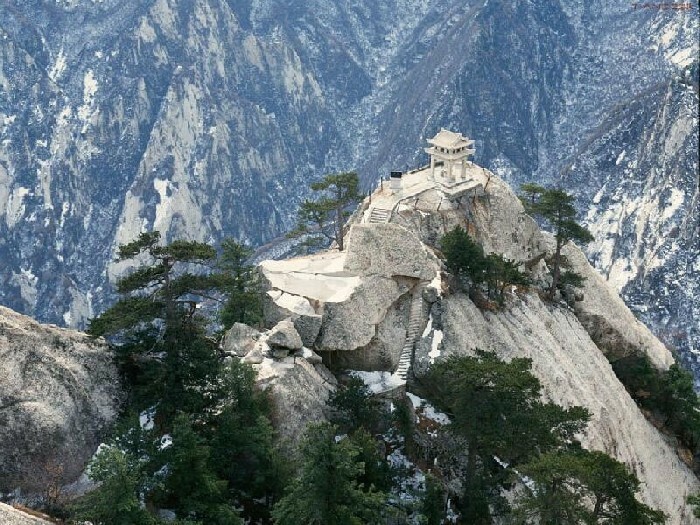 Tourists put their lives in danger to get to a teahouse at the top of a mountain in China. 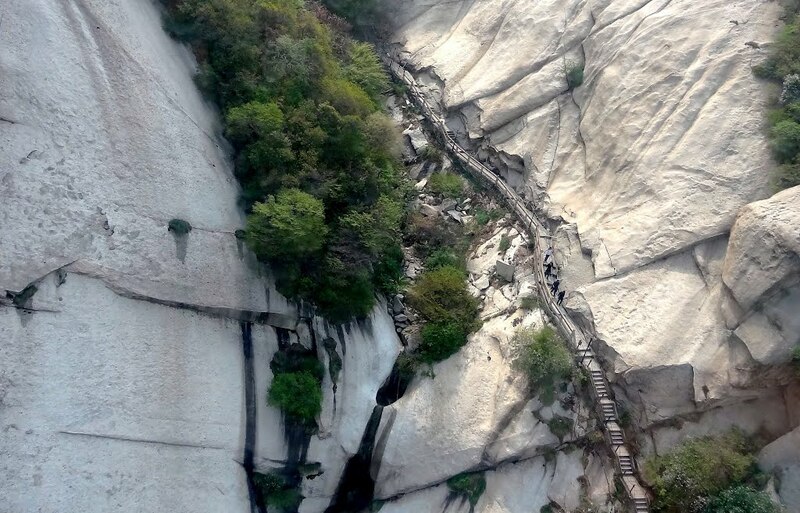 Mount Huashan is located in Huayin, a city located 120 kilometers east of Xi’an, Shaanxi Province of China. Teahouse is located on the southern tip, with an altitude of about 2,160 meters. 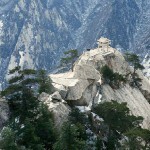 This tea house is one of many Taoist temples that are on the five peaks that make up Mount Huashan (Hua Shan or) in China. For the first inhabitants practiced asceticism and not used to travel, daily meditation was filled with tea. Thus, over the years, the temple was converted into a tearoom. Road to the teahouse start with a huge range of stares, at the base of the mountain, with the name “Divine stairs” (“the Heavenly Stairs”). 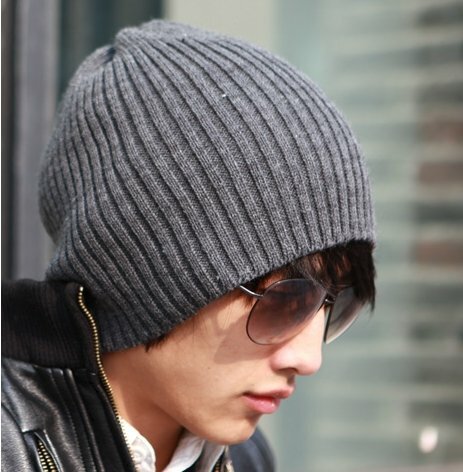 Steps lead up so that it is difficult to figure out, from the bottom, where it ends. Once at the top of the stairs, passing by small villages and homes, you have to take a gondola to reach the southern tip. 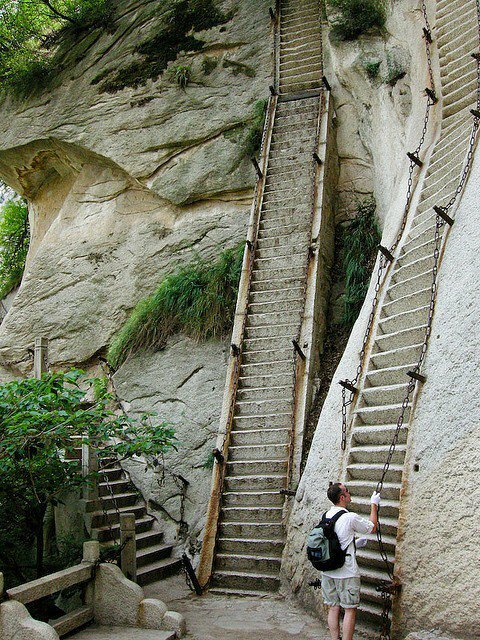 Although rickety stairs are the most accessible part of the journey. At the southern tip of the chain Huashan road ahead could rightly be included among the most dangerous in the world. The path consists entirely of thin planks fixed on steep mountain, and the only thing you can support some chains are attached. There are pieces of rock to be loaded simply using traces dug. Seen on a map, Huashan mountain chain appears in the form of flower. Temple converted into a tearoom while, was built in this place because each of the five peaks to be busy with something that would complement the flower.